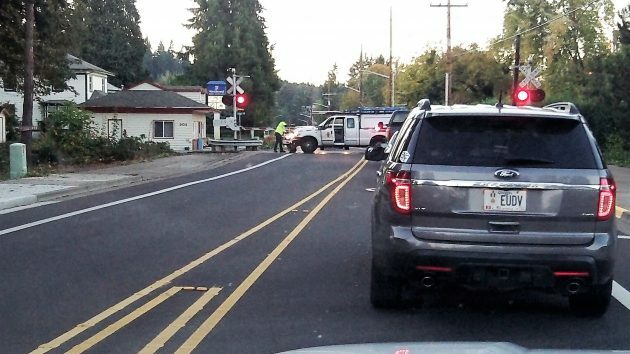 A railroad man works to get his truck aligned on the Portland & Western track Monday evening. For 39 years I’ve crossed the railroad tracks on North Albany Road just about twice every day. In yet on Monday I and maybe a couple dozen other motorists were treated to a sight that was novel at least for me. The crossing arms came down. But it wasn’t for a freight or for any other kind of train. The arms came down, the blinking lights came on, and the warning bell was clanging so that a railroad maintenance guy could get his truck properly situated on the track before lowering the auxiliary wheels that transform the truck into a vehicle that runs on rails. He did this carefully and as expeditiously as he could. But evidently something didn’t go right the first time. After lowering the back wheels and then the front, and shifting his truck back and forth, he had to raise the front pair again and try to get them aligned once more. And all this under the watchful scrutiny of drivers on both sides of the lowered crossing arms. The guy did the best he could, being on his own and without a helper to give him signals. So he had to go back and forth a time or two. It took him only a couple of minutes or so, but you know how it goes when you’re in a hurry and somebody is holding you up. It always seems longer than it is. I would be curious as to how closely intertwined the much ballyhooed Konopa-Kellum partnership is developing over the rain tax issue. I ask that Mr. Hering continue to act as citizen Eyes & Ears and that he to keep close watch over this deceptive duo. I know that you’ve had your ear to the ground regarding the Albany political scene for several years. Few have mastered the Local Scene as you. That said, I am hoping that you will carefully examine what several have noticed -namely the political “hook-up” now taking place between Mayor Konopa and the Ward 3 councilor, Kellum. I know that originally, when Kellum was elected, that he and the mayor seemed to be at loggerheads most of the time. And for good reason. The Mayor has a public persona she Prefers we see – that of a moderately progressive politician who loves her community and claims to wan only what’s best. We also know that Mr. Kellum has long-positioned himself as the antidote for progressivism. Long before he ever ran for public office, he made no secret of his utter disdain for liberals and moderates. However, if you watch the playback of the City Council’s Wednesday sessions, pay careful attention to the intriguing non-verbal interaction taking place between the Mayor and Councilor Kellum. They appear to be conducting some unspoken alliance for political ends we can only guess at. Check it out! Such a tease. Awaiting the next post on the rain tax. Where is it? Thank you for your encouraging words. That is my husband on those tracks & everyday he says that people do nothing but yell and honk their horns at him. He is now aware that some actually appreciate his job. People don’t realize that his job is to protect the public from those massive machines. Stay safe out there. Clearly, though, this job requires teamwork. Having a fellow worker would speed up the process and ensure safety. Maybe someone called in sick that day.